A quality baby bedding set is essential in making your nursery warm and inviting for your newborn. All Cotton Tale patterns are made using quality materials and are uniquely designed to create your perfect nursery. Part of the Pirates Cove collection, ships set sail round a pirate 'Neath a black and white dot canopy to the tunes of Brahms Lullaby. A blue print sheaths the mobile neck. A quality baby bedding set is essential in making your nursery warm and inviting for your newborn. 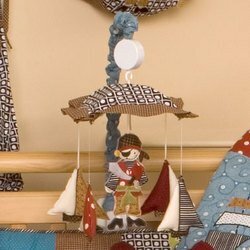 All Cotton Tale Designs patterns are made using quality materials and are uniquely designed to create your perfect nursery. 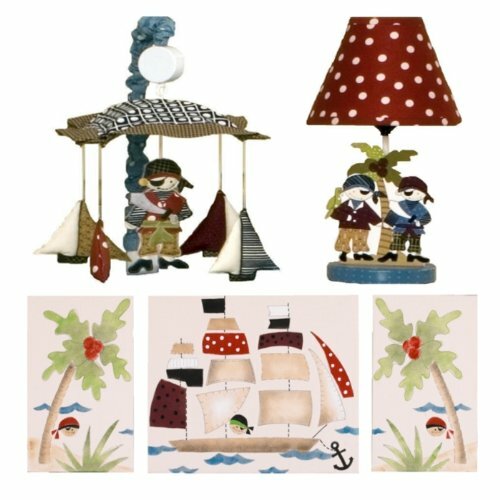 The Pirates Cove Decor Kit includes Wall Art, Decorator Lamp, and Mobile. Complement your nursery decor with these hand painted artworks on white canvas covered foam board, part of the Pirates Cove collection. These large colorful pieces of art are the perfect addition to your baby's room. Light weight and easy to hang from attached ribbons. (2)10" x 16" and (1) 20" x 16". Light dusting only. 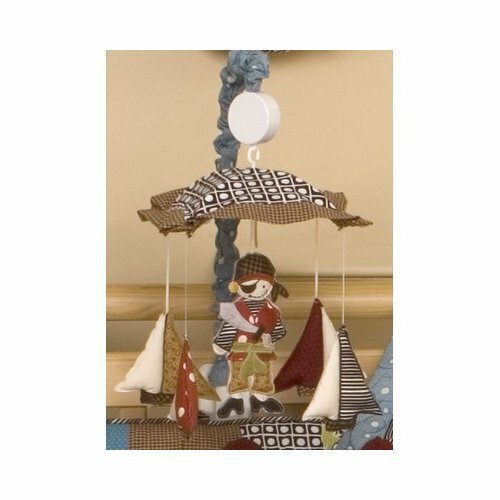 Part of the Pirates Cove Decor Kit, this decorator lamp has wooden cut-outs of the pirates and palm tree and is topped with a red polka dot print shade sits securely on the base. Spot clean only. Lamp stands 15" tall. Max bulb recommended is 40 watt. 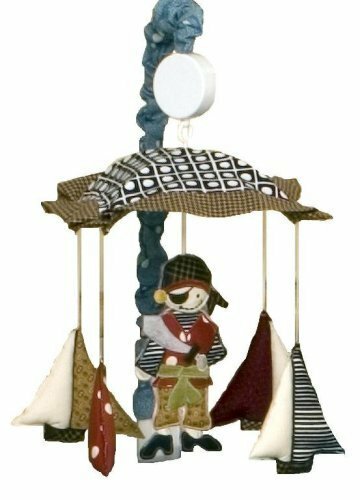 The last piece of the Decor Kit is the Pirates Cove Mobile, ships set sail round a pirate underneath a black and white dot canopy to the tune of Brahms Lullaby. A blue print sheaths the mobile neck. Wind up mobile. Spot clean only. Mobiles are not toys and should be removed from the crib when baby can sit up unassisted. A quality baby bedding set is essential in making your nursery warm and inviting for your newborn. All Cotton Tale patterns are made using quality materials and are uniquely designed to create your perfect nursery. 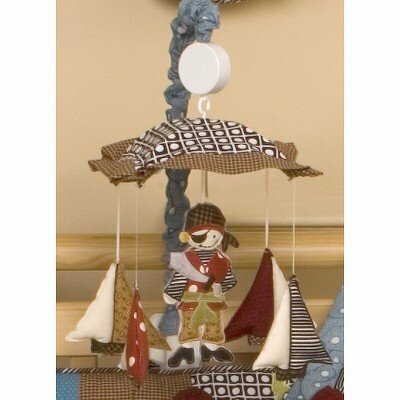 Part of the Pirates Cove collection, ships set sail round a pirate 'Neath a black and white dot canopy to the tunes of Brahms Lullaby. A blue print sheaths the mobile neck. Part of the Elephant Brigade collection is the wonderful, happy, elephant Mobile. It has 5 baby elephants spinning around a quilted canopy with stripe trim. Arm covered in stripe bias. Music is Brahms Lullaby. A quality baby bedding set is essential in making your nursery warm and inviting for your newborn. All Cotton Tale patterns are made using quality materials and are uniquely designed to create your perfect nursery. 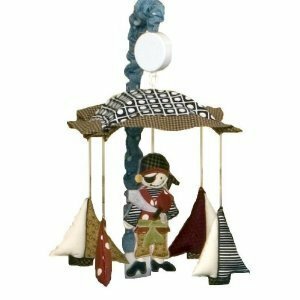 Part of the Pirates Cove collection, ships set sail round a pirate 'neath a black and white dot canopy to the tune of Brahms Lullaby. A blue print sheaths the mobile neck. Copyright © Wholesalion.com 2019 - The Best Prices On Pirates Cove Musical Mobile Online.